BraceLab’s mission is to provide the best medical braces on the market so that patients can get back to doing the things they love, as quickly as possible. BraceLab is the exclusive distributor of Push® premium braces in the United States. Push braces are uniquely designed in consultation with medical experts to be anatomically correct and provide optimal support with minimal restriction of daily activities. Push braces are made in Europe with premium quality materials and workmanship for maximum comfort and durability. 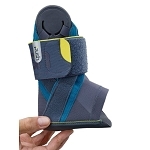 Arthritis Supplies is proud to offer these excellent PUSH orthopedic braces and supports from BraceLab. Upper arm zipper allows uses to easily put on and take off the brace. Recommended by therapists for conservative treatment for pain relief associated with epicondylitis, tennis elbow or golfer's elbow. 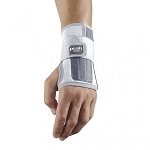 Stabilizes and protects the middle thumb joint (MCP joint) with an adjustable strapping system. Custom fit for maximum CMC (basal) joint stabilization.